Christmas may come but once a year, but thankfully the season doesn’t end in the church’s Liturgical Calendar on December 25th. After all the bustling activity leading up to Christmas Day, we get more time afterwards to reflect on the wonders of the Incarnation. Think of it! God first assumed a human nature to save us from our sins, most vulnerably, as a little baby in a stable in a cave in Bethlehem! As mentioned here, in being born in such a seemingly lowly circumstance, Jesus wished to highlight for us how much he values true humility. Yet He also shows us His place as the “King of Kings” and “Lord of Lords” (1 Tim 6:15; Rev 17:14) in that He as a newborn baby is worshiped by shepherds (Luke 2:15-20) and kings (Matt 2:1-12) alike! I’d like to focus here on those kings (also known as the Three Wise Men or the Magi) who followed the Star of Bethlehem that they saw in the sky heralding our Lord’s birth. Matthew’s Gospel refers to them as Magi, a word for astrologers, although tradition associates these men with royalty. They followed that star to the cave outside Bethlehem to pay homage to the “newborn king of the Jews” as they referred to Jesus (Matt 2:2). Their journey is remembered not only on Christmas Day, but more prominently, afterwards, in the United States and many other countries on the first Sunday after New Years’ Day on what we call Epiphany (although the official date of Epiphany is January 6th). This year, Epiphany is celebrated in the United States on January 3rd, 2016. This special holiday also commemorates Christ's manifestation to the gentiles (in this case the Magi). Epiphany is also called Three Kings Day and children receive their gifts on this day in many Latin American countries (as well as in Puerto Rico and Spain) in commemoration of the gifts of gold, frankincense and myrrh that the Magi brought Jesus! In honor of this blessed event, I’d like to offer this selection below. It's taken from a chapter entitled The Adoration of the Magi from the book the Life of Mary as Seen by The Mystics. 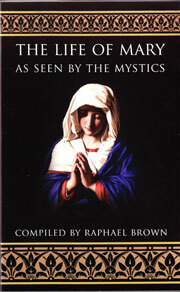 Raphael Brown, its author, masterfully wove together various mystical accounts of events in the life of our Lord and Our Lady. Although these private revelations by no means constitute a Fifth Gospel, they are faithful to the Gospel accounts, and as such, have been deemed worthy of belief by clergy over the centuries. We read in this account reprinted from the book below of the great joy the Magi experienced when they saw the Christ child, the great hospitality the Holy Family showed them, and the evil anguish of King Herod, who went on to order the massacre of all babies under the age of two in Bethlehem (Matt 2:16) in an effort to kill the little baby Jesus who he saw as a threat to his power. One particularly intriguing point made here is that the Magi arrived in Jerusalem thinking that would be the most logical spot to find the long awaited Messiah but when they got there they found...nothing. Our God is truly a God of surprises! Born in Bethlehem? Not in the Temple or a palace surrounded by worshipers? Nope! We are not required to take as fact any of the details enhancing Matthew’s Gospel account given below (such as the names and other descriptive information given about the Magi and their entourage) but I have found them most helpful for meditations and hope you might too. On behalf of Our Catholic Prayers I would like to wish you all a Blessed Christmas, Epiphany, and New Year! Joseph and Mary therefore set about preparing the grotto for the visit of the Kings and during the following days the Blessed Virgin saw in visions the Magi travelling together across the deserts east of the Holy Land. The three Kings whose names (according to tradition) were Gaspar, Balthasar and Melchior, ruled over what is now Iraq and Iran. Gaspar of Mesopotamia, the youngest, was light brown in appearance, Balthasar of Parthia was dark brown, while Melchior of Media, the oldest, was rather stout and had an olive-colored complexion. Through their knowledge of the Old Testament prophecies and of certain traditions of their own peoples, they believed in the coming of the Savior of mankind. Each King was accompanied by four or five relatives and friends and a large number of servants, all riding on camels, dromedaries or horses, and consequently the caravan consisted of about two hundred persons. At times, while contemplating the mystic star, the good Kings spontaneously composed and sang lovely canticles, with words such as "Beyond the mountains we yearn to kneel at the feet of the newborn King!" At last, after crossing the river Jordan, they arrived before the walls of Jerusalem, which, because it was he capital of Israel, they thought was the logical birthplace of the new King of the Jews. "Where is the newly born King of the Jews? For we have seen His star in the East and have come to worship him." But to their astonishment, the guards and the other Jews indicated they knew nothing about the birth of a new King of Israel. Then, at the request of the Magi, messengers were sent to arrange an interview with King Herod in his palace. And while they were waiting, the three Wise Men became very discouraged and only recovered some of their confidence after a period of silent prayer. 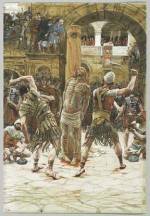 Herod having agreed to see the Kings the following morning, the caravan camped for the night in a large courtyard. But the Magi could not sleep. Instead they wandered through the city with guides, and studied the sky as though they were looking for the star. They thought that perhaps Herod wanted to hide the Child King from them. "In Bethlehem of Judea, for thus it is written of the prophet." Becoming still more disturbed and fearful for his throne, Herod thereupon resolved to have the Infant King secretly put to death. 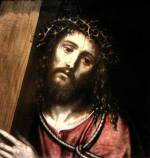 Taking some of the priests with him, he went onto a porch and tried in vain to see the star of the Magi. Meanwhile the scholars urged him to pay no attention to the fantastic stories of the Eastern rulers, for they insisted that, if the Messias had indeed been born, the fact would already be known both in the Temple and in the Palace. Realizing how unpopular he was among the people, Herod decided to keep the whole matter quiet. He therefore received the Magi in secret, at dawn the following morning in a large hall in which refreshments and bouquets of flowers had been prepared for his guests. 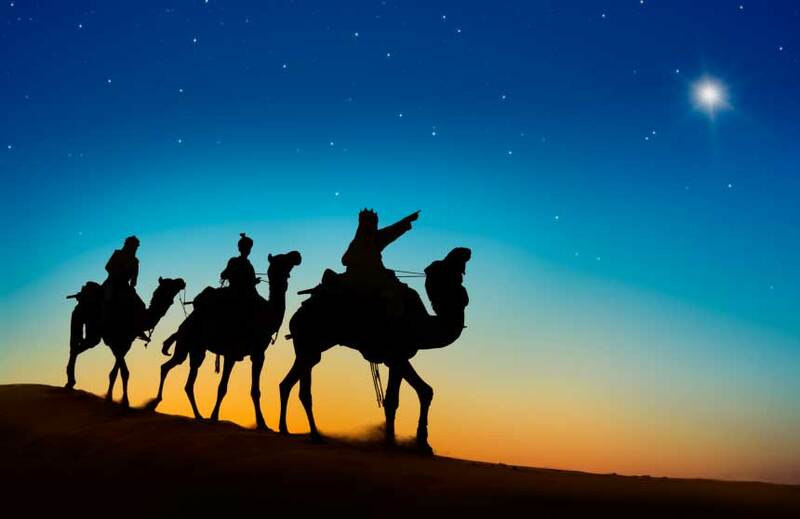 After having made them wait for a while, he entered, accompanied by several doctors of the Law, and proceeded to question the Wise Men closely concerning the time when the star had first appeared to them and concerning all that they knew about the Infant King. "Go and make careful inquiry concerning the Child, and when you have found him, bring me word that I too may go and worship Him." Leaving the King very ill at ease, and without taking any of his refreshments, the Magi set out with their caravan for Bethlehem.....When they arrived at the City of David toward evening, the star disappeared again, and they felt somewhat anxious. Then, accompanied by a shepherd, they returned to their tent in order to prepare for the solemn ceremony by which they planned to honor the Savior. And after having assembled their gifts and put on their great, white silk cloaks, they set out for the grotto in an orderly procession with their relatives and servants. After taking off their sandals and turbans, the three Kings entered the grotto. At their first sight of the Mother and Child, they were overwhelmed with reverence and admiration, and their pure hearts overflowed with joyful devotion. By a special permission of God they also perceived the multitude of resplendent angels who were attending the King of Kings. Then the three Magi , simultaneously prostrated themselves very humbly on the ground and fervently worshipped the divine Infant, acknowledging Him as their Lord and Master hey and as the Savior of all mankind. 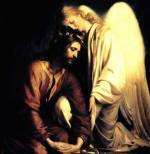 "My spirit rejoices in the Lord, because among all the nations He has called you to behold the Eternal Word Incarnate. Let us therefore praise His Name!" Then she uncovered the upper part of the Christ Child's body, which was wrapped in red and white swaddling clothes, and with one hand she supported His head, while she put the other arm around Him. "We saw His Star--we know that He is to reign over all kings--and we have come to worship Him and to offer Him our gifts." Then Gaspar took from a purse hanging at his waist a number of small gold bars and laid them at Mary's feet. Next the copper-skinned Balthasar placed a golden censer with green incense on a table in front of Jesus. Finally Melchior came forward and left on the table a lovely little flowering shrub which gave forth myrrh. Then they congratulated St. Joseph on his good fortune in being chosen as the husband of the Mother of the Messias, and expressed their profound sympathy over the dire poverty in which the Holy Family was living. After the Magi had been in the stable for three hours, they withdrew, and their servants were allowed to enter in groups of five and to adore the Child Jesus. Meanwhile, outside the grotto, the Magi and their relatives stood around a great old tree and joyfully chanted their evening prayers. Then they went to their tent, where St. Joseph and some of the shepherds had prepared a light supper for them consisting of bread, fruit, vegetables, and honey. As he sat there eating with the good Kimgs, Joseph was so happy that his eyes filled with tears. And when he returned to the grotto he and Mary were overflowing with a joy that they had never known before, as at last they saw how Almighty God had brought to His Incarnate Son the honors and gifts that were due to Him. The next day the Magi generously distributed food, clothing and money among the needy families of Bethlehem, and the sent their servants to the grotto with many choice presents, which Mary set aside for charity. The Kings planned to return to Jerusalem the following morning, and so they now went to say farewell to the Holy Family. After chanting their evening prayers, the Kings and their attendants retired for the night--until, about midnight, an angel warned them in a dream to leave at once for the East without passing by Jerusalem.